The Orange take on Duke on February 23rd and it’s the BIGGEST sports day in CNY! 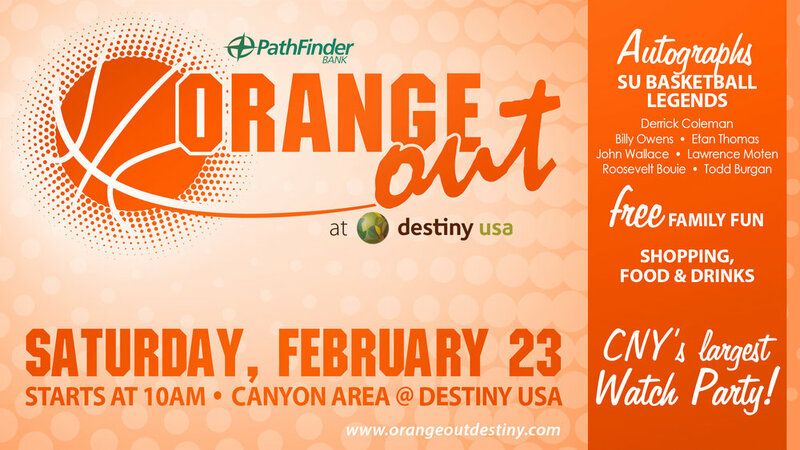 Join us as we “Orange Out” the Canyon Area at Destiny USA. Our FREE celebration will feature what CNY Craves: access to former SU basketball legends, fun activities indoors for the family, shopping, foods, drinks and so much more! Stop by to meet SU legends and enjoy an orange themed afternoon! Ongoing entertainment and activities will keep the excitement alive ALL day long. The event will culminate with a large “watch party” for those fans that don’t have tickets to the game!